My background was in the Theravada school before coming involved in the Tibetan tradition. The first thing I noticed was the difference in the style of sitting - in the Theravada we would often sit for extended periods of time, but usually a single session would be for an hour. Within this we would have only one focus of attention, more often than not the breath. How does this translate into the practices of Tibetan Buddhism, do you still develop Jhana or practice Samatha? In my school we train Shamata and Vipassana, but it's not everyday we go into the Jhana states were you experience those physical miracles. In the Geluk school, Calm Abiding (shamata, shine) and Special Insight (vipassana) are presented. If they seem to be presented as two different practices, whether they are two aspects of the same practice (which is what most Theravadin teachers seem to say, such as Bhikkhu Bodhi, Thanissaro Bhikkhu, Ven. Analayo, etc.) or two different practices is arguable. What is certain, though, is that the union of calm abiding and special insight is what one should aims for. It is even that very union, which is one of the seven preparations on the access level concentration, that makes both calm abiding and special insight "fully qualified calm abiding and special insight". Before that stage, a meditation is but "of the type of calm abiding" (non-analytical) or "of the type of special insight" (analytical). It is said that analytical meditation is "of the type of vipassana", although not actual vipassana, as actual vipassana is "analytical meditation on emptiness" (analytical does not equate with conceptual, and does not necessarily exclude conceptual either). If I say that, it is because in our everyday life in the monastery, we do something like only five minutes of cultivation of calm abiding by focusing on the breath or the mental image of the Buddha before engaging in analytical meditation (for instance, contemplating the nine points of death in order to find an object such as "the intention to turn away from negativities", "the mind of renunciation", "the aspiration to take refuge so as to seek protection from the negative actions we have engaged in and that we will have to 'carry' with us even after we die", or other objects on which we then place the mind non-analytically, in a shine fashion). Usually, we do 45 minutes sessions, with 5 to 10 minutes "on the breath" at most. The rest is "looking for the object, through analysis" and "placing the mind on the object we found, dwelling on it". Hugely helpful actually. This is something that I have been trying to reconcile for years. So to go a little further, what's the difference between the result of the analytical style and that of the Theravadin style. the latter seems passive and the former very 'active'...how does one place ones mind using 'placement meditation' once the object has been found, like Emptiness? I share your impression that the former seems very 'active', so much that, at times, at the very low level I am, I had the feeling that I was brain washing myself when doing analytical meditation in that fashion. I think it happened because of going too fast. You can not get anyone to accept the predicate of a subject by exposing a reason he doesn't accept, even when the reason is factually concordant. In the same way, you can try to convince yourself of things, but you mustn't go too fast in it, otherwise it'll feel forceful, unpleasant, alienating. In my case, I find both ways not contradictory. You can get to observe how impermanent the abiding of mental factors is by doing Theravadin style, for instance, even from a very beginner level. The ways of "placing the mind" is made on the mode of shamata (shine). The function of the mind is non-analytical, it is supposed to be free from excitement and laxity, and therefore established in stability, clarity and vividness of clarity. Of course, before reaching calm abiding, there will still be excitement, laxity, and so forth, but the main point is, for instance, to focus and dwell, without further thinking, on the aspiration to seek protection that you might find through contemplating death. One topic of meditation (like death, for instance) might help find you many different objects, but you'll take one object at a time. Tsongkhapa's Middle-Length Lam Rim (see Jeffrey Hopkins's translation of The Final Exposition of Wisdom) and Lam-Rim Chen Mo are real good in describing all the process. Post-Scriptum: about emptiness, you can reach calm abiding (as 'the contemplation of a mere beginner') with any object, even emptiness. However, cultivating calm abiding by placing the mind on emptiness is by no means a way to get to realize emptiness, either inferentially or directly. It might ease its (subsequent) realization, though. It is very difficult to reach calm abiding on emptiness, because one needs to find the object and emptiness is no easy object to find. One must generate a correct understanding, a mental image of emptiness though listening and reflecting on it first. Actually, emptiness is the lack of the object of negation (the objective aspect of the object of negation being 'inherent existence', according to Prasangika). It may be better to keep emptiness as an object of analytical meditation (what Tsongkhapa will call actual vipassana). There are several ways of doing so. Meditating on the four essentials is one of them : (1) identify the objective aspect of the object of negation such as you conceive of it (i.e. identify for instance the sense of "I" arising within you when someone accuses you of having committed a misdeed you have not engaged in) (2) ascertain that if it was indeed inherently existent, it would have to be either intrinsically one or intrinsically different from the aggregates, and that here is no 3rd option (so that if it is neither, it is just not inherently existent) (3) ascertaining the faults to the assertion that it is intrinsically one with the aggregates (for instance 'if it was intrinsically one, there would be five 'I' because they are five aggregates, or there would be one aggregates because there is only one 'I', etc) (4) ascertaining the faults to the assertion that it is intrinsically different from the aggregates (for example, 'such an I would have to be substantially existent, that is I should be able to think of it without relying on something that it is not, such as the body, etc'). You are most welcome, Dhammasponge. Please, bear in mind that I am neither a teacher nor a guide. So, since we are speaking practice rather than dogma, if there is anything I said that you plan to make use of in a persistent and significant way, I suggest you check with a qualified teacher. Also, the FPMT (with Kyabje Lama Zopa Rinpoche as its head) established a study program (it is a 5 years one, in the monastery I stay). In this context, a student is to meditate for at least 45 minutes every day, on a Lam Rim topic (such as 'how to rely on a teacher', 'precious human rebirth', 'death and impermanence', and so forth) in a analytical fashion. In five years, we cover all the topics of the Lam Rim. I tell you this to let you know how it could take form in actuality, in a monastic environment. If Je Tsonkhapa's Middle-Length Lam Rim & Lam Rim Chen Mo are the most precious of 'ornaments', many of us, students, rely on a precious and easy guide for beginners that was compiled by Ven. Ani Karin (from Kopan monastery). The PDF is available here: Lam Rim Outlines - Beginners' Meditation Guide. To most of Lama Zopa Rinpoche's students, I believe it is an authoritative and trustworthy work. Ven. 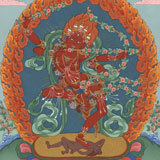 Ani Karin herself is an example even to male western Sangha. But then again, I speak from my corner of the Buddhist world. The meditative state as tranquility will arise. Since everything is not solid like the way we perceive, this will help you to someday have this insight (Vipassana) related to emptiness. So in the Tibetan tradition is there not a practice like Apanapasati for example? Or are you saying that Theravadin meditation practices achieve the same results as those in for example Mahamudra? Do both lead to the Mind experiencing the Mind? Dhammasponge wrote: So in the Tibetan tradition is there not a practice like Apanapasati for example? Yes there is. It is exactly how it is described in the suttas except that one normally does a round of 21 breaths rather than 10 like in Zen. Apanapasati is common to all Buddhist meditation traditions. Dhammasponge wrote: So in the Tibetan tradition is there not a practice like Apanapasati for example? Or are you saying that Theravadin meditation practices achieve the same results as those in for example Mahamudra? Do both lead to the Mind experiencing the Mind? In the Tibetan Gelug tradition (I'm not familiar enough with the other traditions), there is no practice like Anapanasati. You will find centers or monasteries where you can do a 10 days "4 placements of mindfulness" (I translate such a small retreat every year, given in a Gelug monastery), but it has nothing to do with the tradition. It just happens that few western Gelug teachers like this practice and teach it in the center they reside. They usually embed it in a Mahayana framework (with a specific motivation, uncommon Refuge and dedication, etc). As for Anapanasati, I don't think there is the idea of "the mind experiencing the mind". Not only is it a purification practice, it is also to come to directly realize the four noble truths (along with their 12 aspects, in the Theravada context, rather than 16). I recommend you Ven. Analayo's book called 'Anapanasati Sutta, the direct path to realization'. Also, in relation to Tibetan Geluk meditation practices, Leah Zahler compiled the most formidable account taking from the greatest sources (such as Jamyang Sheba, etc), it is called "Study and Practice of Meditation - Tibetan interpretations of..."
Yes, but the object of our focus is different. We focus on deities that are an assemblage of wisdoms and qualities. Theraveda focuses on wisdoms and qualities also in a less symbolic way. In Theraveda you generate bliss on the winds to facilitate jhana, we also do but a different way. I think that the differences between Theraveda and Vajrayana are mostly superficial. I dont think that there is A way of achieving shamata in tibetan buddhism. DIfferent schools, different teachers offer different methods such as using mental image as support, shamata without a sign and even stage of generation. It seems that mindfullness of breathing is use as a preparation for other shamata methods for people with more agitated minds. I dont think that tibetans use the "nimitta" approach. It does seem that tibetans tend to contempt with access to the first jhana. I recommend "the attention revolution" by alan wallace. tlee wrote: Yes, but the object of our focus is different. You work in some capacity for a Vajrayana group I assume from your previous posts. It is shocking that you say this. Theravada has no bodhicitta (Including the different meditations of bodhicitta), no profound emptiness (emptiness of phenomena), no tantric anatomy. It falls exactly into the definition of Hinayana in traditional texts, it is not even gradual Mahayana like Kamalashila or nongradual Mahayana like Hashang. TaTa wrote: I dont think that there is A way of achieving shamata in tibetan buddhism. DIfferent schools, different teachers offer different methods such as using mental image as support, shamata without a sign and even stage of generation. It seems that mindfullness of breathing is use as a preparation for other shamata methods for people with more agitated minds. I dont think that tibetans use the "nimitta" approach. Actually the dhyanas and how to develop them are described in many Tibetan texts. The Bhavanakramas describe how to develop shamatha. It really deoends on your school and your teacher, but first dhyana at least is quite important for a few teachers.